Sudoku For Dummies, Volume 2 will offer 240 original and addictive puzzles including new circular and 16 x 16 puzzles to add new dimensions to game play and keep the most avid Sudoku fan entertained. Of the 240 puzzles, 220 are the popular 9x9 puzzles, 10 are 16 x 16, and 10 are circular puzzles. Within each of these categories there are Easy, Tricky, Tough and Diabolical puzzle ratings; and each puzzle is clearly identified with the rating. More than just a listing of puzzles, Sudoku For Dummies, Volume 2 features a chapter explaining how to solve puzzles and the strategies involved. Additionally, readers receive all puzzle solutions in the back of the book. 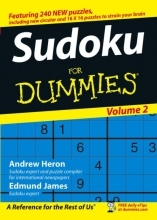 Finally, Sudoku For Dummies, Volume 2 includes a brief history of Sudoku for those interested. Descriptions of the newer types of puzzles are listed below. The rules are similar to the normal 9x9 Sudoku but with some important differences. The puzzle is circular for a start, with 8 concentric rings. Each ring must contain the numbers 1-8 and each segment running into the centre of the circle and through to the opposite side of the circle must contain the numbers 1 - 8 and or course there can be no duplicate numbers. The grid is larger at 16 x 16 and solvers must fit the letters A-F into the grid alongside the numbers 0-9. 16 x 16 Sudoku are more difficult, take more time and are more infuriating than the normal puzzles - but just as addictive! Chapter 2: Taking Sudoku Up a Notch.